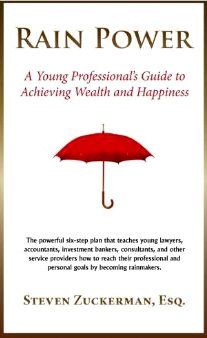 “Rain Power” by Steven Zuckerman is an innovative and pragmatic six-step plan that teaches young lawyers, accountants, investment bankers, consultants, and other service providers how to reach their professional and personal goals by becoming rainmakers. What ‘s a rainmaker? Someone who creates and delivers value. Someone who makes themselves indispensable to an organization. Steve Zuckerman, a successful investment banker, attorney, and entrepreneur, has synthesized the lessons he has learned through considerable trial and error into a replicable formula to help young professionals achieve success, wealth, and happiness. Unlike countless books that offer shallow guidelines and mere platitudes, “Rain Power” provides a detailed, practical approach. It’s even got a chapter on meditation, which the author presents as a foundational practice that leads to a focused and satisfying life. Stillness is a form of concentration, and happiness is an energy that drives success. Professionals afflicted with hamster-on-a-wheel syndrome will benefit immeasurably from this imaginative and practical book. – Thomas Hauck is a leading freelance book editor serving both emerging and professional authors of fiction and non-fiction.